I needed another project to work on & came across this Fine Woodworking article by Lon Schleining with instructions for creating a copy of the lap desk Thomas Jefferson used to script the Declaration Of Independence. As this project offers extensive hand tool work, I proceeded with construction. I made two of these desks, the first constructed out of my stock black cherry, however Lon suggests the use of plywood which would have solved my first problem, bowed lids with the cherry. I then secured some mahogany for the second attempt, which worked out well. 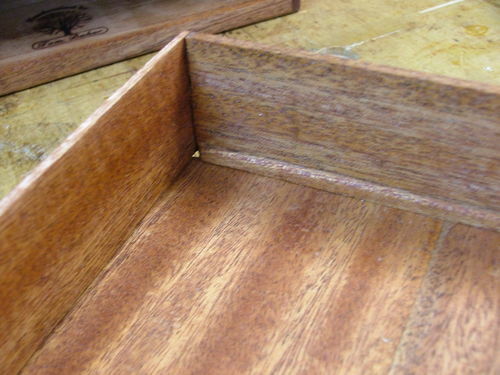 I read that mahogany is good at retaining its flatness when milled thin. Resawing the mahogany to just over 3/8” and 1/8” pieces then hand planing to final dimensions proved to be fun as mahogany mills like warm butter. All in all, this was a fun project to work on. a good challenge and you won. – NICE !! Lovely desk. I hope it gets frequent use. A great desk. Jefferson would be proud to use it. Great job! You did a mighty fine job. That looks intricate to make, well done. That’s some craftsmanship, Tom. Great joinery. From my vantage point it looks like the original! That’s a fine-looking desk. 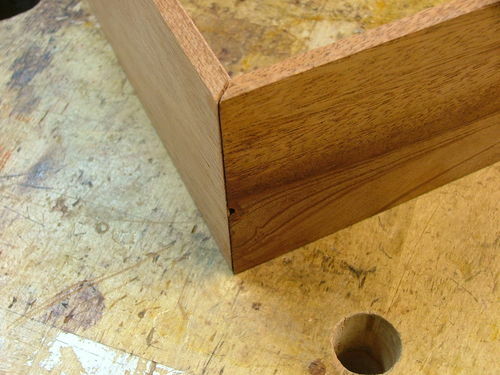 Bookmarked for me to tackle once I can cut a couple dovetails in a row without a disaster. Now I have a goal to practice for! Very nice work Oldtool. Details are great and hand skills are mighty fine. This is a nice reproduction of Jefferson’s desk. Based on the pictures I have seen it’s close if not an exact copy. You did a fine job on it. Great craftsmenship and use of hand tools. I’m building a 21” high arts & crafts clock from QSWO and was going to resaw the oak to 3/8” to cover the clock movement and tile from the back I know the oak will bow. I have a piece of mahagony and was wondering if it would bow like the oak when resawed. Now I know it won’t. Thanks for sharing your knowledge. I love this box, I have seen the article and will say you did an absoutely fantastic job on the build, beautiful!